How many Concordes are there and where are they? 20 Concordes were built and 14 entered airline service. There were 2 prototypes, 2 pre-production models and 2 "first off the line" production models. Of these, five are on show in museums and the sixth will eventally go on display. British Airways own 7 Concordes and Air France now have 5. Of the other two production aircraft which were owned by Air France, one was withdrawn from service and used for spare parts from 1982 onward, and the other crashed in 2000. In 2003 the aircraft were put on show around the world. It was all down to Cost: The Airlines were not making back the money spent on the safety modifications and other upgrades, with some other big costs coming up (tens of millions, before any life extension programme), BA need to write off �M now rather than �0M in 3 or 4 years. Air France wrote off a large sum of money too. With the premium first class market non-existant post 9/11, there was no hope of paying back the modification cost to start with, forgetting about any further investment that was required to keep the aircraft in the air. Day to day the aircraft still broke even, but could no longer pay back any big expenditure items, so its days were numbered. It is a sad time, but the inevitable really only came forward a few years from the ends of its technical lifespan. 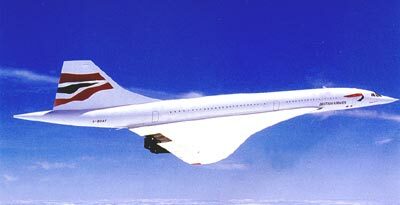 We should celebrate what Concorde was and still is, the only profit making Supersonic passenger Jet ever to go into service - the Americans could not even do - that's how far ahead of its time it was...and still is! Did any other airlines fly Concorde? Yes and no. No other airline has owned a Concorde apart from Air France and British Airways, but Singapore Airlines operated a joint service with BA in 1979 in which a British Airways Concorde (G-BOAD) had a Singapore Airlines livery on one side. Both Air France and British Airways ran a joint service across the Atlantic from Europe to the US from London/Paris to Washington and then on to Dallas with Braniff International for a short time in 1979-80. The US domestic leg was flown by Braniff aircrew under a US style "N" registration. 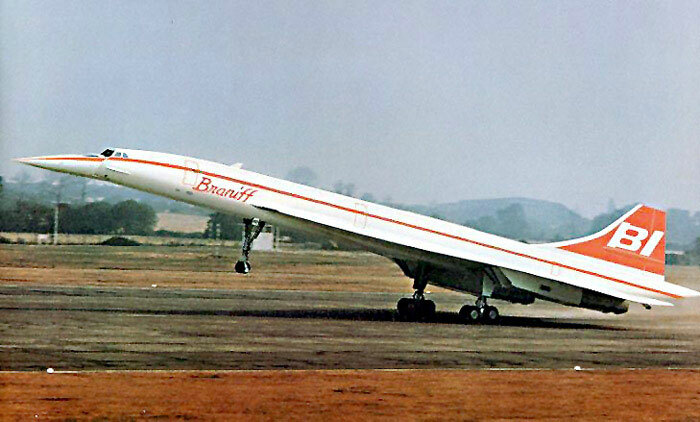 No Concorde was ever painted in a Braniff livery, although there were many artist impressions of what one would look like. The only change was in the registrations. When in the US the "G" or "F" was covered up with white tape!!!! How fast, far and high does Concorde fly? The aircraft flies at twice the speed of sound (Mach 2), which is around 1350 mph (depending on the temperature of the surrounding air). Take-off and landing speeds are considerably higher than for traditional subsonic aircraft. The range of the aircraft, with 100 passengers and 9 crew, under the correct conditions is about 4,500 miles. The maximum height Concorde can fly to is 60,000 ft (over 11 miles high). With some restrictions on load, the aircaft easily flies the 4250 mile trip to Barbados. The outside temperature on the tip of Concorde's nose can reach 127 degrees Celcius (260 degrees Fahrenheit) due to the friction of the air at high speed. How long did Concorde take to fly across the Atlantic Ocean? A normal subsonic service took around 7-8 hours to fly from London to New York, but Concorde's average flight time is around 3 hours 30 minutes, but can be slightly longer if the aircraft needs to hold before landing at the local airports. The fastest ever time for the crossing, the fastest ever set by a passenger aircraft, was 2 hours 52 minutes and 59 seconds. This was set by Captain Leslie Scott and his crew onboard G-BOAD, flying from New York to London, on the 7th of February 1996. Where did the name Concorde come from? In January 1963, the suggestion that the aircraft should be called "Concorde" emerged from an informal family chat in the home of a BAC executive. It was arrived at by the simple process of thumbing through Roget's Thesaurus. At this family discussion, the first reaction to the suggestion of "Concorde" was the question: "With the 'e,' of course?" To which the answer was: "Yes." When the suggestion was put forward officially, the British side approved it tentatively and then submitted it to the French. There were some preliminary murmurs of approval but the subject was regarded as a matter for decision by "higher authority." It is ironic that the first indication that the name had been officially adopted in France came in the famous speech by General de Gaulle in which he dashed Britain's hopes of joining the Common Market. In it, the French President mentioned "the Concorde supersonic airliner" and said there was no reason why this kind of scientific and industrial collaboration between the countries of the Six and Britain should not continue. So the project had a name. Or, rather, it had two names for the British government soon decreed that in this country the spelling "Concord" should be used. This trifling difference proved to be a small but recurring source of friction for several years. But at the roll-out of the first Concorde prototype at Toulouse in December, 1967, Tony Benn, MP, then British Minister of Technology, finally resolved what he described as the only disagreement with France that had occurred during the years of co-operation on the project. He had decided, he said, that the British "Concorde" should from now on also be written with an "e."
What was the cause of the Paris accident in July 2000? The investigation concluded that what happened is that during its take-off run Concorde ran over a strip of titanium that had dropped off the engine of a Continental Airlines' DC10. This caused a tyre to burst which threw up debris that hit the underside of the wing, causing a shockwave in the fuel present in the loaded tank. This in turn caused the tank to fail from the inside out. The leaking fuel was ignited, possibly from the 115 Volt systems for the carbon brake cooling fans. Due to a lack of fuel and ingestion of debris, power was lost on engine no.2. With severe air flow distortion from the fire, the no.1 engine also lost thrust and the aircraft fell out of the sky as not enough power was available to keep it flying. A full detailed description of the cause of the accident is available in the accident section. When did Concorde return to service? Concorde aircraft that completed the modifications programme had their Certificate of Airworthiness returned. How much does a Concorde cost? In 1977, the airlines bought their initial complement of 9 aircraft for around � million each ($46 million US dollars). This would equate to around �0 million ($350 million) at todays prices. its was decided in 1979 that 5 unsold aircraft were to be placed with the state airlines if no further byers were found.. BA bought a/c 214 and 216 for a nominal costs of around of a few thousand pounds, but did pay the going rate of over a million pounds to fit out the 'white tail' aircraft to their standard. In 1984, BA bought to government out of the Concorde programme for £16.5M, they gained title to the remaining spares tooling and aircraft 202, a primary part of the deal was that BA bought its way out of the 80/20 profit split, that was in favour of the governemnt. The airline took on the full Concorde program running costs at this stage too, which were around � million PA, and many hundreds of millions over the next 20 years. 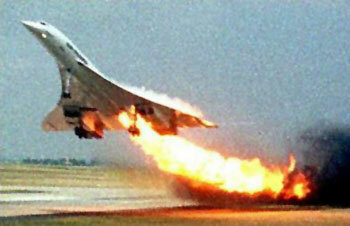 The development costs of Concorde were around �134 billion, which was funded by the UK and French governments. The cost to build the 16 production Concordes was �4 million of which �8 million was recovered through sales returns (this included spares, technical support, etc.). This debt was also funded by the 2 governments. Airbus, would simply not have existed or have been as successful a company that it is today, have concorde never made it off the drawing board. the initial high outlays by the respective governments was the foundation of the European aviation industry that we have today, and this is all thanks to Concorde, and the skills and knowledge that this brought. Did Concorde make a profit for the airlines? Because of the premium rate that passengers would pay to fly on Concorde (First Class +20%), the aircraft only needed to be around half full to break even and turn an operating profit. The airlines spent many millions on the modifications to return the aircraft to service, based on flights returning to the same levels that they were pre-accident and pre-Sept 11th 2001. The normally higher loads (around the 75% mark) and a 2nd daily flight, along with a large charter operation, allowed the airlines to invest in the aircraft and keep it flying. Another very important role of Concorde has been as a PR and marketing tool. Regular First Class and Business Class passengers will be given free Concorde upgrades to tempt them to continue to fly with the two airlines. 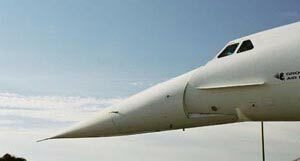 Why does Concorde's nose droop down? Because of its needle shaped design, the pilots would not be able to see the runway during take-off and landing. So to help improve the view the nose is drooped down to 5 degrees for take-off and 12.5 degrees for landing, where the aircraft is pitched up at a very high angle of attack. Initially the droop for landing was to be 17.5 degrees but this was found to be too low, as the nose was down right out of view and did not give the pilots a visual point of reference. Where did Concorde fly to? Concorde's only scheduled services were once-daily service between Paris and New York for Air France, and a twice-daily service between London and New York for British Airways. BA also operated a once a week service to Barbados in the winter (Dec-Apr) when the UK weather is not pleasant. It's still very hot in the Caribbean, even through it is winter there too. All other flights are charter flights which have taken the aircraft all over the world to well over 150 destinations. Concorde does not fly supersonically over land as the sonic boom would not be socially acceptable, so most routes are transcontinental. A full list of visited destinations is in the History section. Did Concorde need a special or long runway? No, as a rule of thumb Concorde can land and take off on any runway that could handle a Boeing 747 jumbo jet. There are some exceptions; for example if the runway is too bumpy or not properly equipped. Under special circumstances the aircraft can be lightly loaded and operate out of even smaller airfields. Why does Concorde have an extra wheel under its tail? Because of its design, Concorde takes off and lands with a very high angle of attack. If over-rotated during take-off or landing there is a chance that the rear of the aircraft could scrape along the runway. The tail wheel protects the rear fuselage and the engines (which could touch the ground first if the aircraft is not perfectly level when landing) from damage under such conditions. In practice it has touched the ground only very rarely!